Memory is set to Auto timings on the 680i and memory speed is linked to the FSB for the overclocking tests. This removes memory as any kind of impediment to the maximum stable overclock. Linked settings on the 680i are a 1066FSB to a memory speed of DDR2-800. As FSB is raised the linked memory speed increases in proportion. The same processor is used in all cooling tests to ensure comparable results. 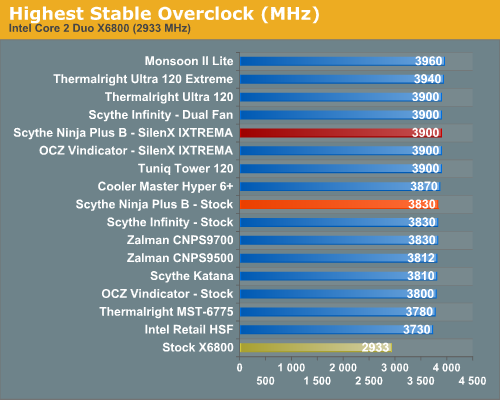 The Scythe Ninja Plus B with the stock fan could only reach 3.83GHz overclock with stability. This is a little better OC than the OCZ Vindicator with the stock fan and matches the performance of the Scythe Infinity with a single stock fan. 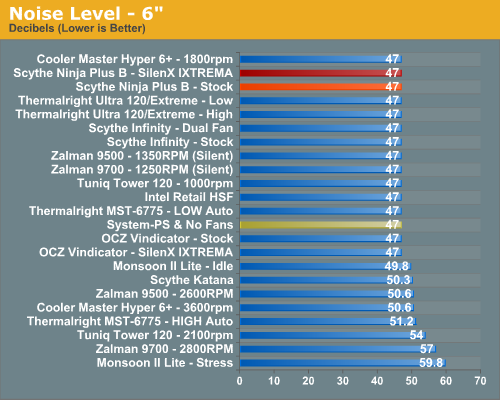 It is not, however, performance comparable to the top tier of the heatpipe towers tested. However a change to the 72 CFM 14 dB-A SilenX IXTREMA 120 allowed us to push the overclock to 3.90GHz with complete stability. 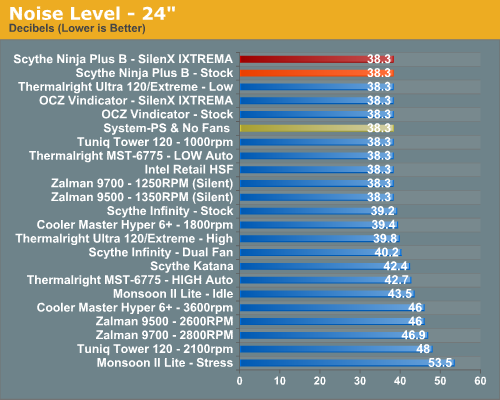 This does match the top tier of overclocks achieved by the Tuniq Tower 120, Thermalright Ultra 120/Scythe SFLEX, OCZ Vindicator (with SilenX), and Scythe Infinity with dual push-pull fans. The only air cooler that has reached higher than 3.90GHz is the Thermalright Ultra 120 Extreme, which was featured at CeBIT. We managed 3.94GHz with that top air cooler. The hybrid TEC/air Monsoon II Lite reached 3.96GHz in benchmarking, but that cooler combines active TEC cooling with passive air cooling and would be expected to reach higher overclocks than an air alone solution. For many enthusiasts upgrading cooling the goal is maximum stable overclock, and they will live with the inconvenience of a louder system. For other users silence is the most important factor, and these users will forgo maximum overclocking if that increases system noise levels. We measured noise levels with the Scythe Ninja Plus B with both stock and SilenX IXTREMA fans under both load and idle conditions. The fans have specified noise ratings of 20.9 dB-A and 14 dB-A, and the measured noise with both fans was below our system noise floor at both 6" and 24" positions above the open side of our system case. There are virtually no power supplies that do not include a fan. While Zalman and a few others do make an expensive fanless power supplies, we have not seen a fanless unit larger than 500W, or one that would be used for seriously overclocking a system. With that in mind the noise level of the system with all fans turned off except the power supply was measured. The power supply used for the cooling test bed was the OCZ PowerStream 520, which is one of the quieter of the high performance power supplies. We have also measured the Corsair 620-watt and Mushkin 650-watt power supplies which are reported to be quieter than the OCZ. Both the Corsair and Mushkin are indeed quieter at idle or start up speed. However, as soon as load testing begins and the PSU fan speed kicks up the measured noise level is almost exactly the same as the OCZ PowerStream 520 watt power supply. We are currently in the process of evaluating "quieter" power supplies for an update to our cooler test bed. We will make changes to that test bed as soon as we are confident in the noise measurements and test procedures with a variable speed quiet PSU. We plan to evaluate additional power supplies and configurations in our upcoming 120mm fan roundup, at which point we will complete the transition to a revised and lower noise cooler test bed. The noise level of the power supply was 38.3 dB from 24" (61cm) and 47 dB from 6" (152mm). The measured noise level of the test room is 36.4 dB, which would be considered a relatively quiet room with a noise floor slightly below the OCZ PowerStream 520 PSU. Measured noise levels in this chart should be considered worst case. Measurements were taken with an open side of a mid tower case 6" and 24" from the HSF. Real world would be a completely closed case resulting in a further reduction in noise. Any 120mm fan that is a standard 25mm thick should be mountable on the Scythe Ninja Plus B. The fan clips connect to the outside mount hole, which means both open post and the more common closed post fans will work properly. The stock Ninja fan is closed post and the SilenX is open post. This means the SilenX will work on any cooler we have reviewed thus far - including the Thermalright Ultra 120 and Ultra 120 Extreme. Most of the important questions are answered on the package. Included on the typical jam-packed Scythe package are specifications, pictures and a list of compatible sockets, warranty info, and details on of the included 120mm low-noise fan. Eventhough the Ninja is old (and probably doesn't make sense for new system build), a lot of us still have them and it's nice to know that the old Ninja still has what it takes. The suggestion to replace the S-Flex fan is also very nice. At SPCR, everyone uses the Seasonics S12s and M12s for silence. I personally have a S12-430W and it is very quiet. I sleep less than 2 feet away from my system and can barely hear it. I haven't heard the M12 personally, but it should be near silent anyways. Maybe you guys should look into the Seasonics? Good review and definitely appreciate this recent spurt of HSF reviews. Looks like the Ultra 120 Extreme is the way to go... if indeed they've revised their mounting bracket for S775. Do you have any confirmation of that? You have exceptional editing skills. Thanks for pointing out the typos. Corrected. So, how are we going to compare the effectiveness of these coolers when you seem to have used different fans? I can see the point of testing with stock fans (if applicable), but the thing most people want to know is which heatsink that performs the best. Your heatsink reviews also seem to be geared towards heavy overclockers, in which case testing with the stock fan makes even less sense. You don't even provide RPM figures for the fans used on the different coolers. IanCutress: @StarLightPL That's why I said, in future I'm checking my bags. And yes, people do need shaving cream and deodorant, even on short trips.